Valentine’s Day. Hearts. Flowers. Chocolates. Perhaps a little bling. 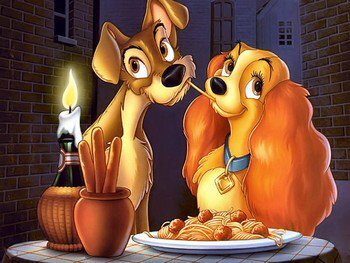 And of course … nice romantic dinners for two. But where does a vegan go for a romantic dinner for two in Charlotte, NC – the city of bankers and BBQ? This year, you have quite a few options! First up, Fern, Flavors from the Garden. Fern is where you’ll find Charlotte’s most elegant and creative vegetarian and vegan food. Fern has come a long way since its beginning, when it was more of a restaurant for the “Meatless Monday” crowd. This restaurant has evolved over time, becoming much more knowledgeable about veganism and offering more and more vegan options, including vegan-friendly wines and beers. 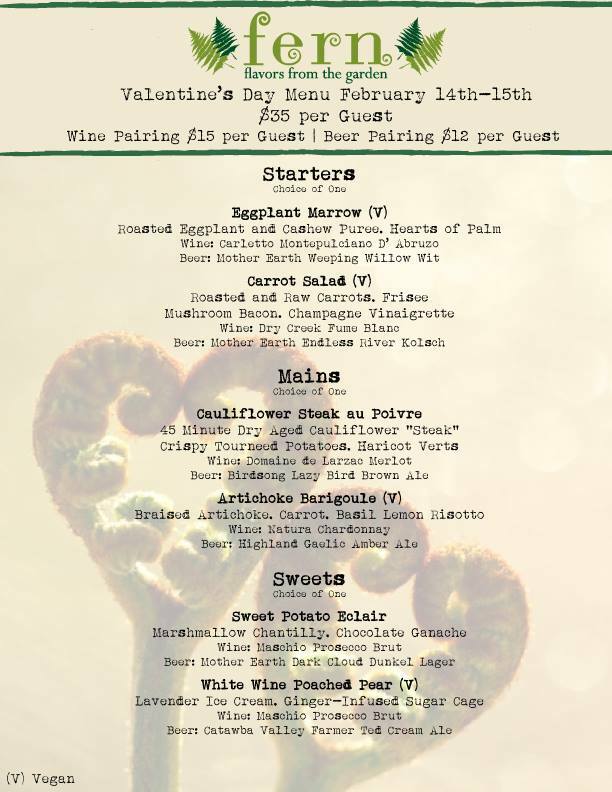 Foodies will applaud the talented Chef Drew’s Valentine’s Weekend prixe-fixe menu. The vegan choices include both appetizers (eggplant marrow and a carrot salad), a main course of Artichoke Barigoule (braised artichokes with carrots and a basil lemon risotto), and white wine poached pears for dessert. It’s $35 per person for an appetizer, main, and dessert. There’s also the option to have each course paired with a beer ($12 extra) or wine ($15 extra). You can also order off their regular menu as well. As of this weekend, there was limited availability for Friday night, but still plenty of available tables for Saturday. If Artichoke Barigoule isn’t quite your thing, maybe you would prefer the $25 per person prixe-fixe dinner at Bean Vegan Cuisine. 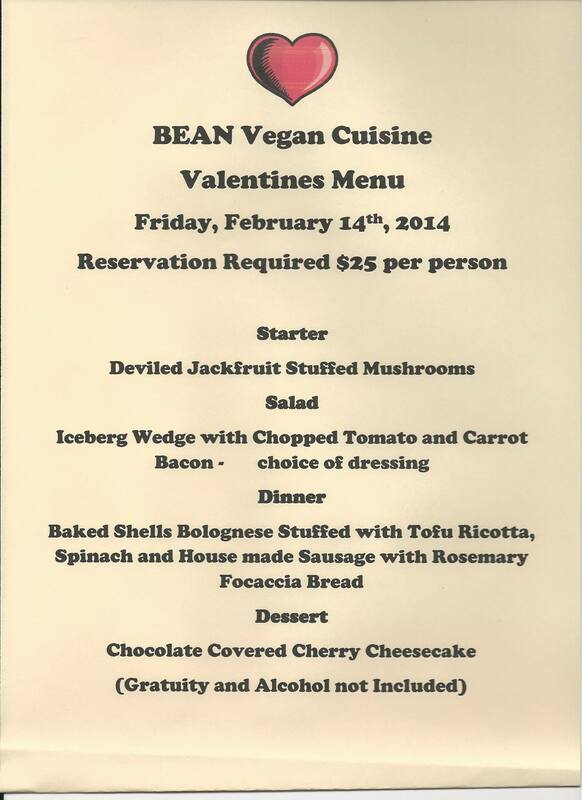 Bean’s special Valentine’s Day menu offers deviled jackfruit stuffed mushrooms (Chef Charlie can make jackfruit taste just like crab), salad with carrot bacon (carrot bacon – better than it sounds, trust me! ), baked shells bolognese with “ricotta” and “sausage,” and chocolate-covered cherry cheesecake. Yum. Seatings are from 5:00 PM to 9:30 PM, and reservations are required if you want this special menu. (If you just want one of Bean’s famous burgers or reubens, you don’t need a reservation.) Call 980-939-1234. Neither Fern nor Bean appeal to you? 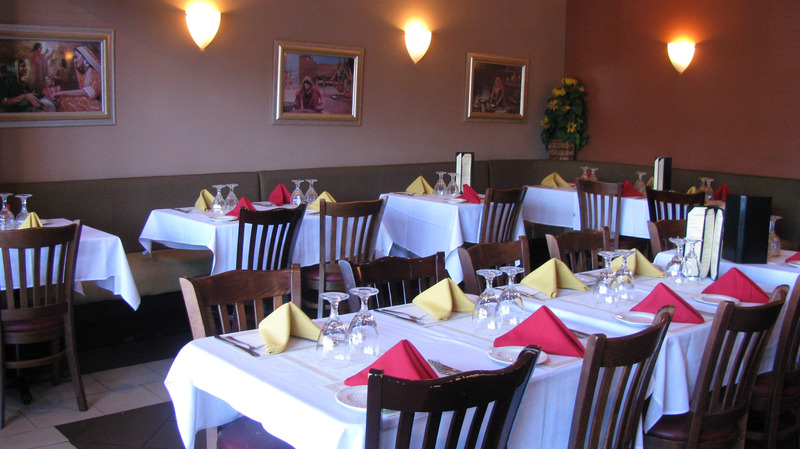 Charlotte also has a number of ethnic restaurants, which offer lots of vegan choices as well as tons of atmosphere. Maharani – White tablecloths, attentive waiters, traditional Indian music, spicy vegan food! Almost every Indian restaurant has a long, long list of vegetarian dishes, and many of them are (or can be made) vegan. (That’s right, you have more choices than just Woodlands.) I know from personal experience (and talking to the chefs) that Maharani Indian Cuisine (Kings Drive) and Sangam (Cornelius) both offer lots of vegan choices. I’ve also eaten many vegan meals at Copper (East Boulevard), Blue Taj (Ballantyne), and Situl. 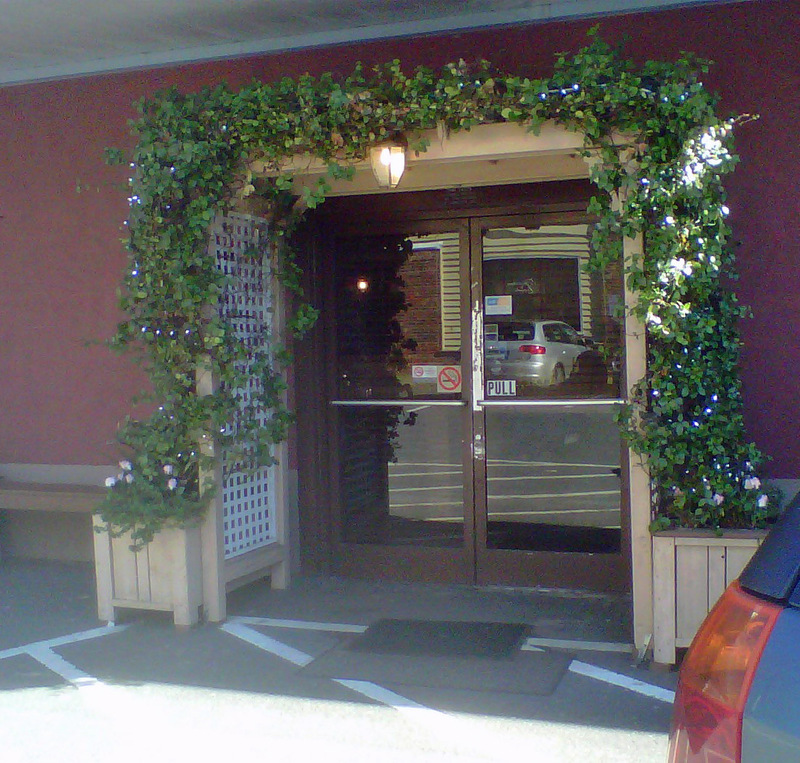 Entrance to the charming Thai Taste. Don’t feel like Indian? How about Thai? Most Thai restaurants offer a number of stir-fries and curries that can be made with tofu instead of meat. A number of Thai restaurants automatically prepare their vegetarian dishes without fish sauce; to be safe, tell them you are allergic to fish. My favorite Thai restaurant is Monsoon (South Boulevard); Bangkok Ocha is dark and romantic (Carmel Commons); Thai Marlai (Cornelius) has a hostess who could double as a stand-up comedienne and offers love advice; and Thai Taste (East Boulevard) is just plain adorable with great service. Or maybe you just feel like picking up a pizza, a DVD, and snuggling with your honey on the couch. Charlotte has plenty of places to pick up a vegan pizza (and I don’t just mean walking into a Pizza Hut and ordering a pizza without cheese). There’s Brixx (5 locations in Charlotte), Mellow Mushroom (3 locations), Fuel (6 Charlotte locations, plus one in Davidson and one in Rock Hill), Pizza Fusion (in the Metropolitan just outside of Uptown), and Pure Pizza (East 7th Street). All offer creative veggie topping combos and vegan cheese. Thai Taste is one of my absolute favorite spots in town. I haven’t been to Bean yet but love Fern as well!! Isn’t the whole ambiance at Thai Taste adorable?! !